Big Joe Roberts in Cops – suddenly realizing his wallet is missing. 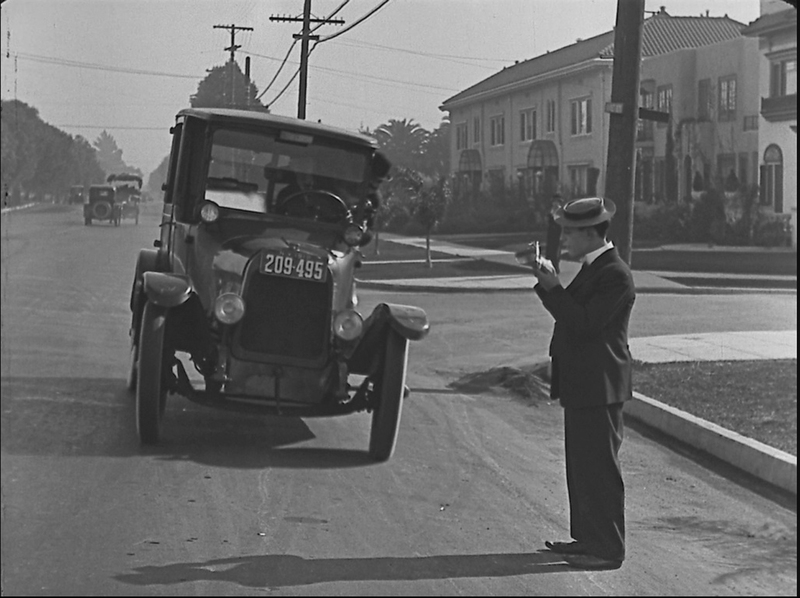 Buster Keaton’s famous short film Cops (1922) remains his only self-produced movie that was filmed completely out of doors, with no interior scenes. 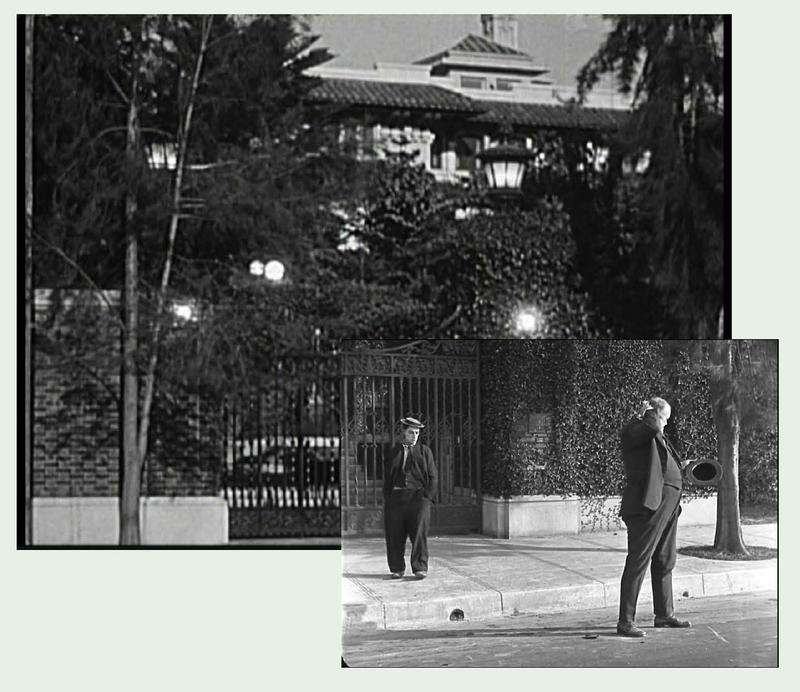 Early in the film Buster helps Big Joe Roberts into a taxi in front of the Pantages estate at 590 N. Vermont (shown HERE), while the scene where Joe leans out of the taxi window to retrieve his wallet from Buster, but not his cash, was filmed miles away at Sunset and Detroit (shown HERE). 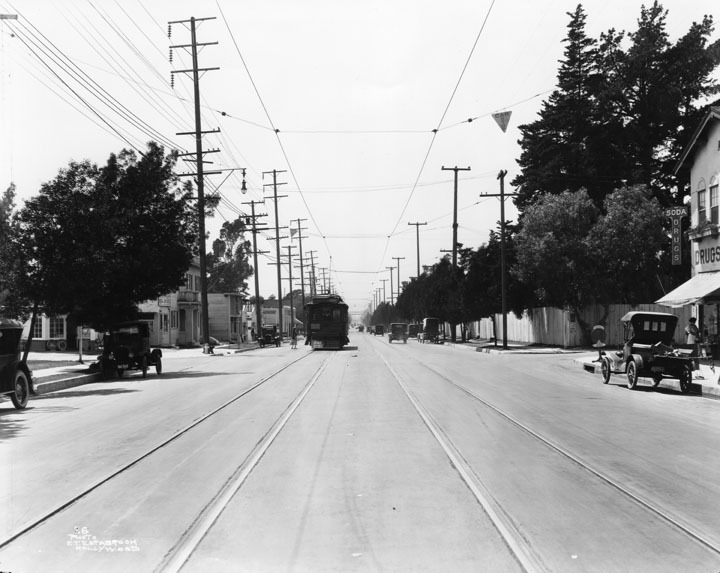 Looking east down Santa Monica Boulevard from Gower. LAPL. The reaction shots of Joe inside the taxi were filmed driving east along Santa Monica Boulevard, past Gower, just a few blocks from the Keaton Studio. 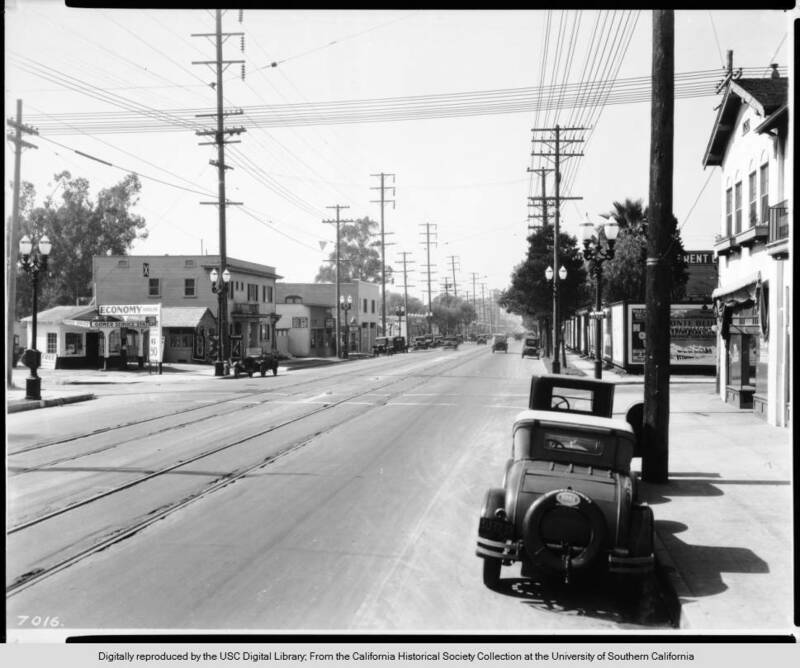 This Los Angeles Public Library view west down Santa Monica from Gower was taken near the time of filming, revealing the Warren Drug Co. that stood at the NW corner. The details match perfectly. 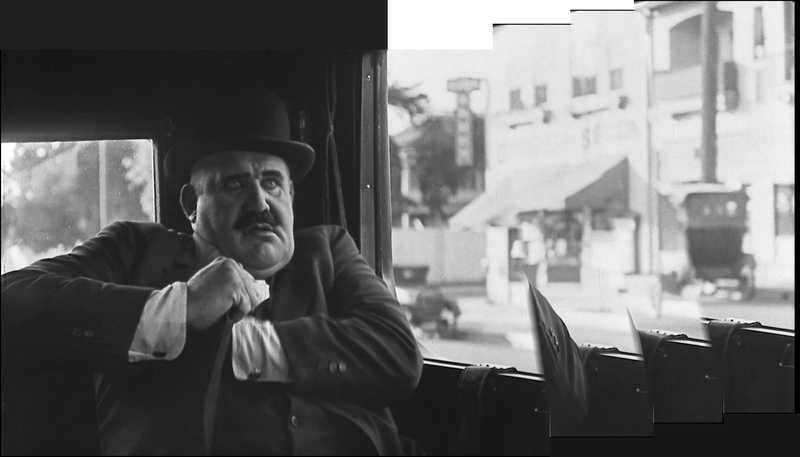 I discovered this scene when I noticed the prominent word “SODA” go by (see below), as a similarly prominent “SODA” sign appeared during a scene from Harold Lloyd’s 1921 comedy short I Do. 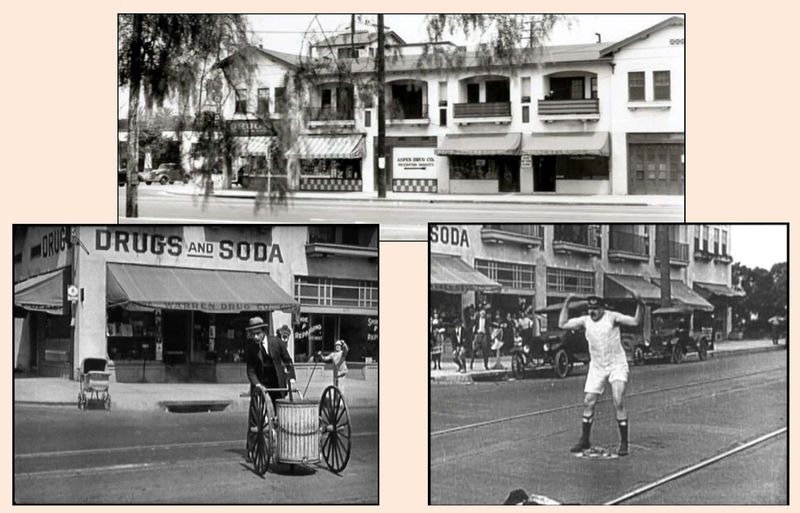 The corner turned out to be the Warren Drug Co. on Santa Monica and Gower. Matching words “SODA” appearing in Cops and in Harold Lloyd’s I Do. True to form, Buster staged this scene just a few blocks away from his studio – see below. Click to enlarge – the Keaton Studio at left (see enclosed barn-like shooting stage), at Eleanor and Lillian Way, just a few blocks west of the corner of Santa Monica and Gower, at left. Marc Wanamaker – Bison Archives. A 1938 view from the site of the demolished Keaton Studio, left, to Santa Monica and Gower. USC Digital Library. 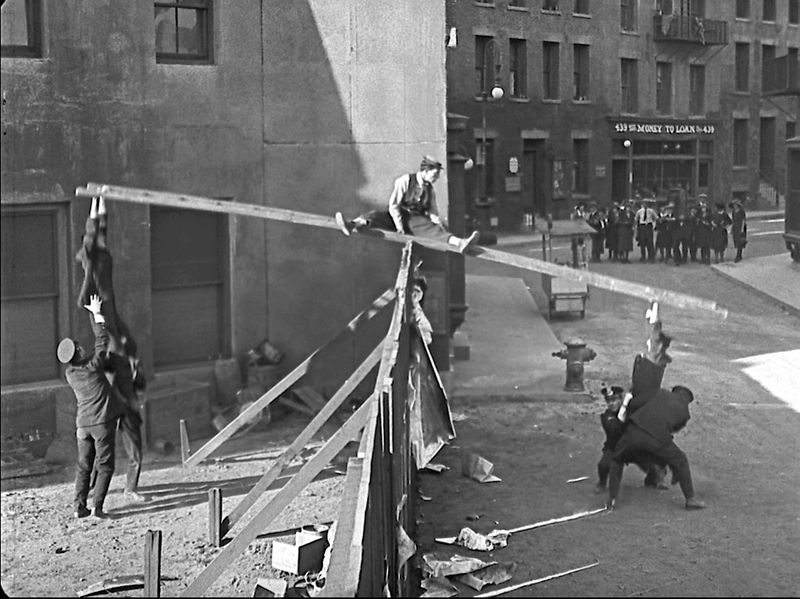 I have now identified every location appearing in Cops, including the stock footage of the policeman’s parade filmed in New York, and all but one of the many backlot shots, including the teeter-totter fence scene (shown HERE). The single remaining mystery is the studio backlot site for the final scene where Buster locks the gang of police within their own station house (at right). My sense is that it was filmed at the Metro lot due south of the Keaton Studio. A similar view west in 1929. USC Digital Library. You can read more about Cops in my book Silent Echoes, and in my many other posts about the film (see list HERE). 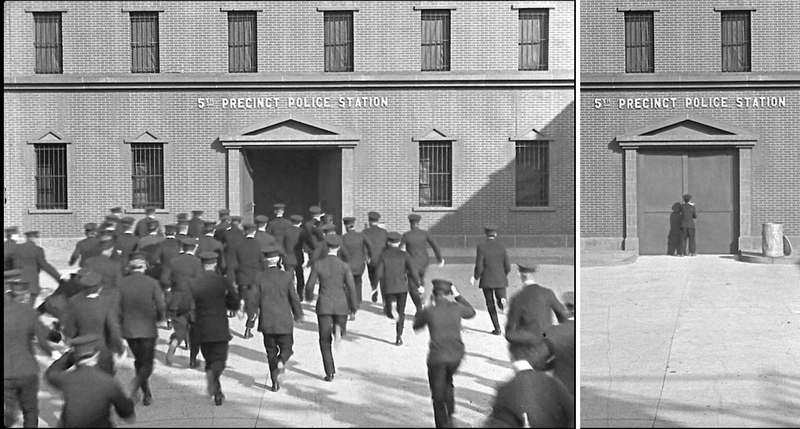 A restored print of Cops will be presented this June 4, 2016 in San Francisco, as part of the annual San Francisco Silent Film Festival. The corner of Santa Monica and Gower today. 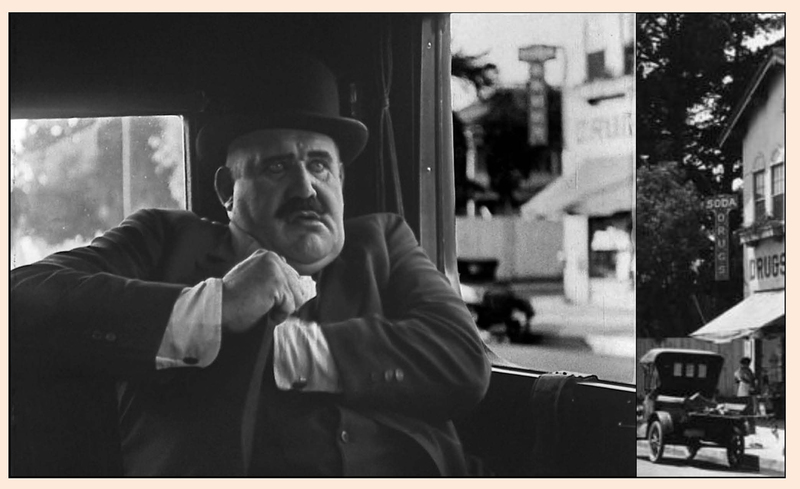 This entry was posted in Buster Keaton, Cops and tagged Buster Keaton, Cops, Gower, Harold Lloyd, I Do, Larry Semon, Santa Monica Boulevard, Silent Comedians, Silent Comedies, Silent Movie Locations, Silent Movies, The Suitor, then and now. Bookmark the permalink.